This plaque and one showing St Paul let down in a basket from the walls of Damascus (M.312-1926) almost certainly came from the same object, possibly a large altarpiece or reliquary casket. The episode depicted here (St Paul disputing with the philosophers) immediately followed his escape from Damascus, shown on M.312-1926. Five other plaques from the same series survive in various other museums. The choice of scenes reflects the iconography of Siculo-Byzantine mosaic cycles in Sicily, probably transmitted to England via contemporary manuscripts. The plaques are thought to be English because of their particularly close links to English manuscript illumination. Links to wall paintings in St Gabriel's chapel, Canterbury Cathedral have also been pointed out. 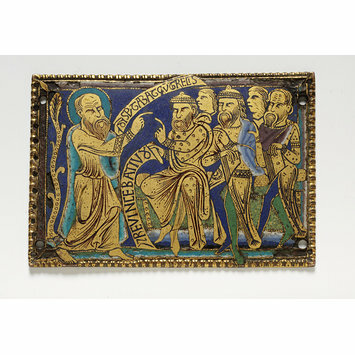 Rectangular copper-alloy plaque decorated with champlevé enamel and gilding. The background is blue enamel, with figures, scrolls and other details reserved, engraved and gilded, and some areas filled with coloured enamel. There is punched decoration on the clothes of all the figures, as well as on a stylised tree. To the far left of the panel is a stylised tree. The haloed and bearded figure of St Paul stands immediately to its right, facing to the right with his proper right arm outstretched, and index finger pointing in emphasis. His proper left hand holds a scroll, which stretches up to the right, with the inscription DISPVUTABAT CV[M] GRECIS (he disputed with the Greeks). His mantle is shown as bright blue enamel, and his halo is turquoise enamel. The centre and right areas of the plaque are filled with the group of five philosophers, three bearded figures in the front row, and two unbearded heads just visible behind. They are sitting on a green enamel seat, and all are facing to the left. The lefthand figure is sitting with his heels together, and knees and toes pointing outwards. He wears a short cloak, in light blue enamel, and a hat. His proper left arm reaches across towards the left in a similar gesture to St Paul's, with index finger pointing. His proper right hand holds another scroll, stretching down to the left, which reads: & REVINCEBAT IVD[AEOS] (and he convinced the Jews). The central figure also points his proper left hand across his body towards the left; his right is bent across his lap, holding a book. His proper right leg is dark blue enamel, and the left is green. He also wears a hat. The third figure holds a book in his proper left hand, while gesturing to the left with his right. An area of drapery across his front is in purple/brown enamel. His legs are the reverse of the central figure's: the proper left leg is dark blue enamel, and the right is green. He is bare-headed. The outer edge of the panel has a beaded border. At several points the design on the plaque stretches out onto this border, particularly with the feet of St Paul, and the central philosopher, and St Paul's scroll. Within this border, is an enamelled border, which originally extended right around the edge of the plaque. Along the bottom and right-hand sides this is blue, and along the top it is white/grey. The enamel border along the left-hand side has been completely lost. The reverse of the panel is flat and plain with a few scratches. There are pin holes in each corner. "He disputed with the Greeks"
"And he convinced the Jews"
Historical significance: The choice of scenes in this group of plaques reflects the iconography of Siculo-Byzantine mosaic cycles in Sicily (cf scenes of St Paul being lowered in a basket and disputing with the philosophers appear at both Monreale and the Capella Palatina, Palermo). These are suggested as a model by Gauthier 1972. Both the V&A scenes (223-1874 and M.312-1926) also appear in a Bible, in the Monastery of S. Paolo fuori le mura, f.307v (illustrated in H. Buchthal, 'Some Representations from the Life of St Paul in Byzantine and Carolingian art', Tortulae: Studien zu Altchristlichen und Byzantinischen Monumenten, Rome, 1966, pl.12). Buchthal suggests (p.48) that the scenes' appearance in this manuscript (an enlargement and improvement on previous illustrations depicting the story of St Paul and dated to around 870) implies a source in a lost Byzantine illustration to the Acts of the Apostles. Gauthier 1972 refers to other tenth- and eleventh-century manuscripts illustrating these scenes including the Gradual of Prüm (Paris, Bibl.Nat.ms.lat.9442, ff.54-5). 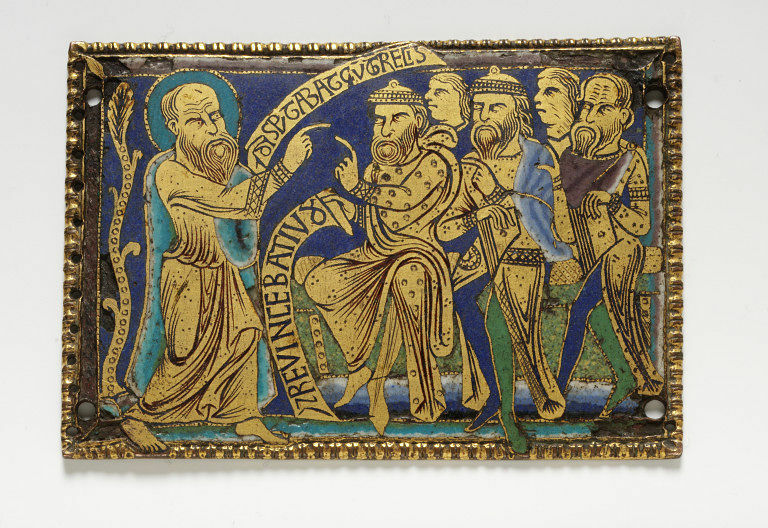 H. P. Mitchell, 'English Enamels of the Twelfth Century - part II', Burlington Magazine, vol. XLIX, October 1926, p.162, and plate 1C. W. Sauerlaender, exhibition review of The Year 1200 exhibition, Art Bulletin, 1971, p.514. Neil Stratford's catalogue entry in English Romanesque Art 1066-1200 stresses the links with Ottonian art in the plaques from this group: specifically in the compositional formulae and the colour palette of the enamels. But both are seen to be transformed in an essentially English way - there are particularly close links to English manuscript illumination. He sees them as representing 'a phase of English art in particularly close touch with developments on the other side of the Channel'. The English attribution is also discussed in detail in the catalogue entry in The Year 1200, where it is described as 'not conclusive' (a Mosan or lower Saxon source is suggested), although the plaques have 'similarities to later English works'. El Arte Románico catalogue cites similarities with wall paintings in St Gabriel's chapel, Canterbury Cathedral, as well as several manuscript sources.